Guard Rail! Why didn't I think of that? No Roots on the trees - OH NO! One of the comments my brother made about the model trees on the layout was that the trees did not have realistic roots, or nebari as the bonsai people say. So this weekend I decided to do something about it. While I was at it, I started adding some final scenery. Yeah! I got out my modeling putty. I mentioned this in previous blogs as I used in in figure modeling. But it was ideal to sculpt the roots for the trees. 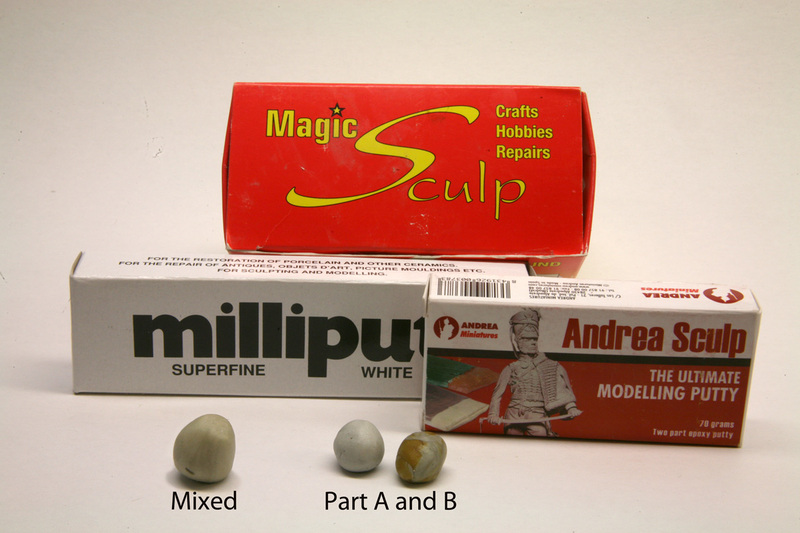 I used Magic Sculpt, but any of the three types in the photo would work. Without heating, the putty cures rock hard in about 2 hours, but can be worked that whole time if needed. You can speed it up by heating it. The first tree I tried to use the putty on was actually a bare Supertree. The trunks of the Supertrees are too thin as they come in the bag. So I used the putty to build up the trunk and add roots. 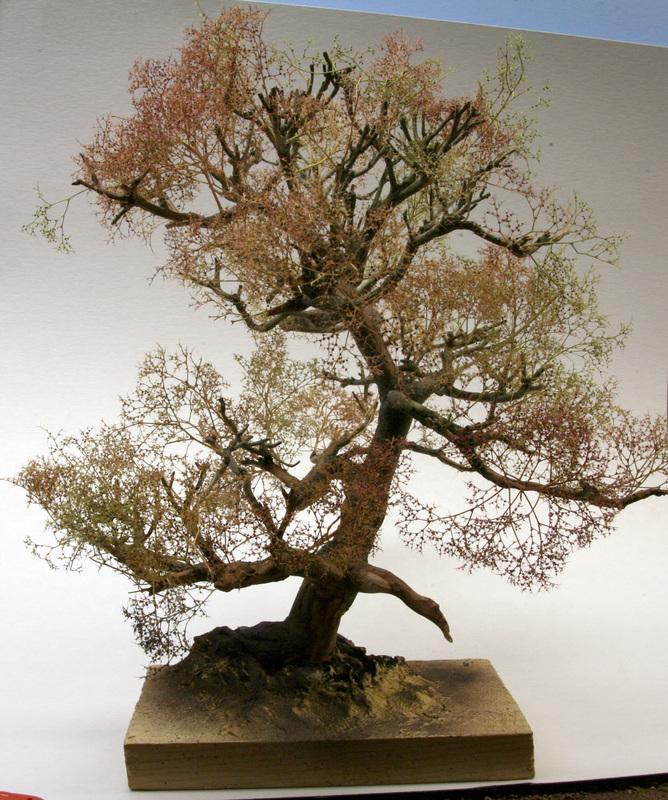 I did this using a piece of cardboard to help shape the roots, but I immediately realized that it is better to sculpt the roots in the spot where you intend to use the tree. The photo below shows some of the trees with roots added. Since this was so simple to do. I decided to add a bunch of stumps. 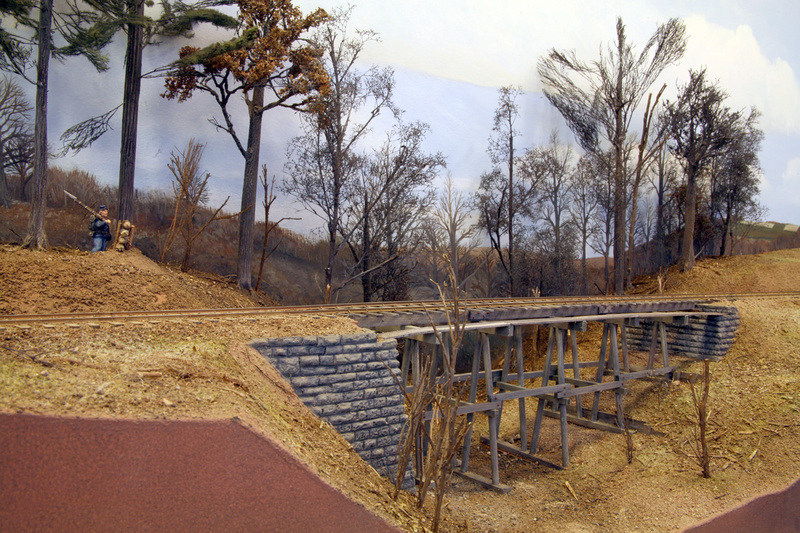 I had painted stumps on the back drop in this area, so I put some 3D stumps in the foreground to link the scenes together. I realized it is a lot easier to make a stump than a tree. Looks like we'll be doing a lot more stumps, which is totally prototypical because the soldiers cut down so many trees for fire wood and construction. Roots on the trees, plus lots of stumps. blend with the trees painted on the backdrop. With the roots installed, I decided to finish the scenery around Clairborne bridge scene. Wow, after two years I will finally have a "finished" scene to look at. Here is a shot while the scenery is drying, It should lighten up a bit as it dries. PVT McGuirk on sentry duty at the rifle pit over looking the bridge. Note the detail in the roots on the tree at the left. 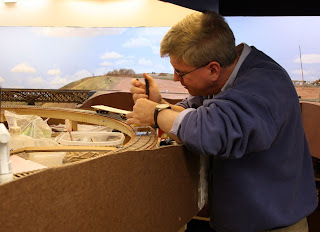 Bill Uffelman, an experienced O Scale modeler from Nevada, visited the layout this weekend. He is currently doing an On30 scale project. After a brief introduction to the railroad, I handed him a throttle and asked him to take a train from staging in Aquia Landing to Falmouth. 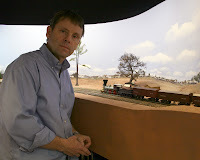 Then turn the engine on the turntable and bring the train back, while dropping a boxcar at Potomac Creek siding. Having a background in operational testing, I figured that having an experienced operator run the layout could would be a good way to find glitches. And find them we did. I had mentioned earlier that humidity changes were causing some track problems resulting in intermittent derailments. One spot where this was happening was in the curve just before the first turnout at Falmouth. This track had been problem free up to now. A gauge check showed some tightness in the gauge. I respiked some of the rail back to gauge standards. I also had a known issue with the Whiton locomotive at the north end of Potomac Creek bridge. 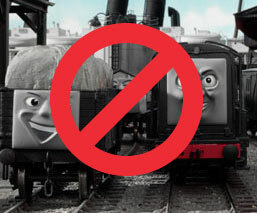 The other locos and cars did not have a problem here. The Whiton's lead truck derailed about half of the time as the train moved north. We went through possible causes, first checking the wheel gauge, which seemed a tad tight on one axle. Then I checked the track gauge, which was OK, but there appeared to be a very slight kink in the curve. There also was a dip in the outside rail. I shimmed the rail and smoothed out the easement. A couple more tests showed that the problem was better, but still was there. At that point Bill suggested a guard rail. That was a great suggestion. I installed a guard rail and ran more tests. The derailments are gone. I made a video showing how it works. His work done, Bill left. But, using the same logic, I added a guard rail to the problem curve at Falmouth after also checking and adjusting the gauge. This seems to help. Lest you accuse me of using a unrealistic crutch, my ridiculously tight curves would probably require a guard rail in the prototype too. For example. 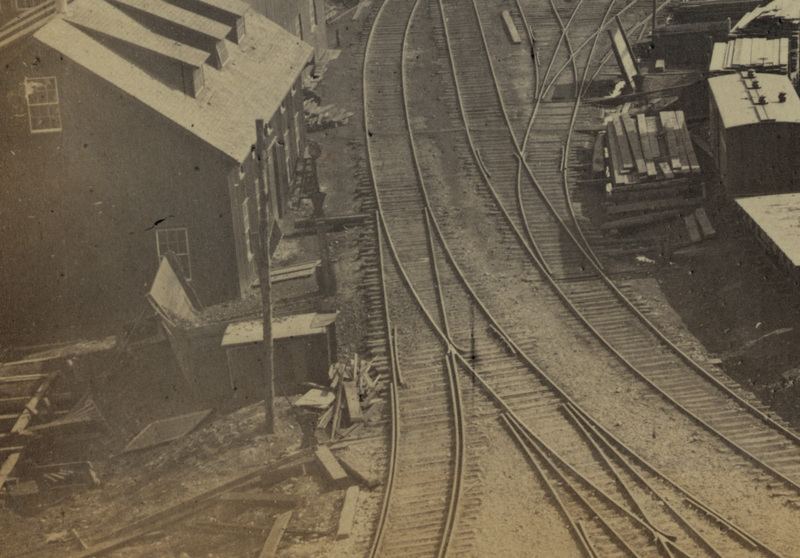 look at the guard rails in the USMRR Alexandria yard. File that in "there's a prototype for everything." the three way turnouts at the lower and upper right. My brother Rob visited this week. 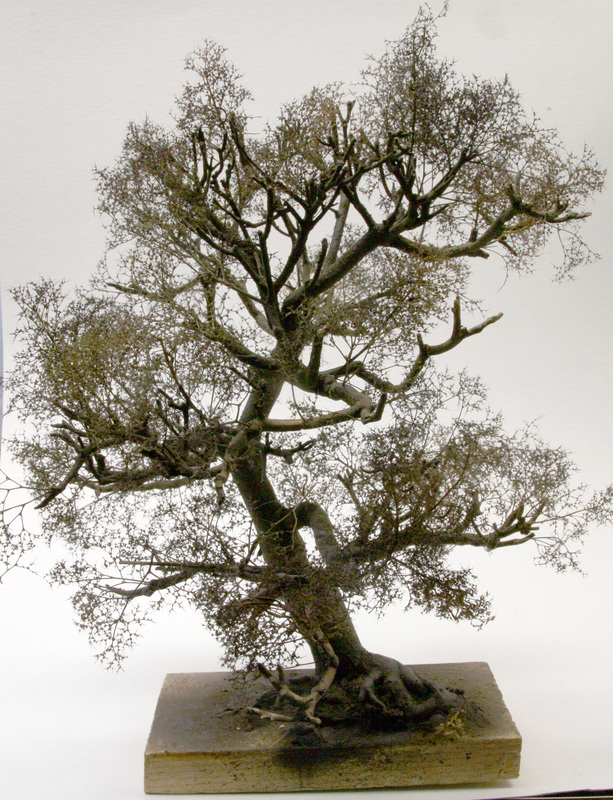 Since we were snowbound, he decided to improve the dead bonsai tree he sent to me last year. 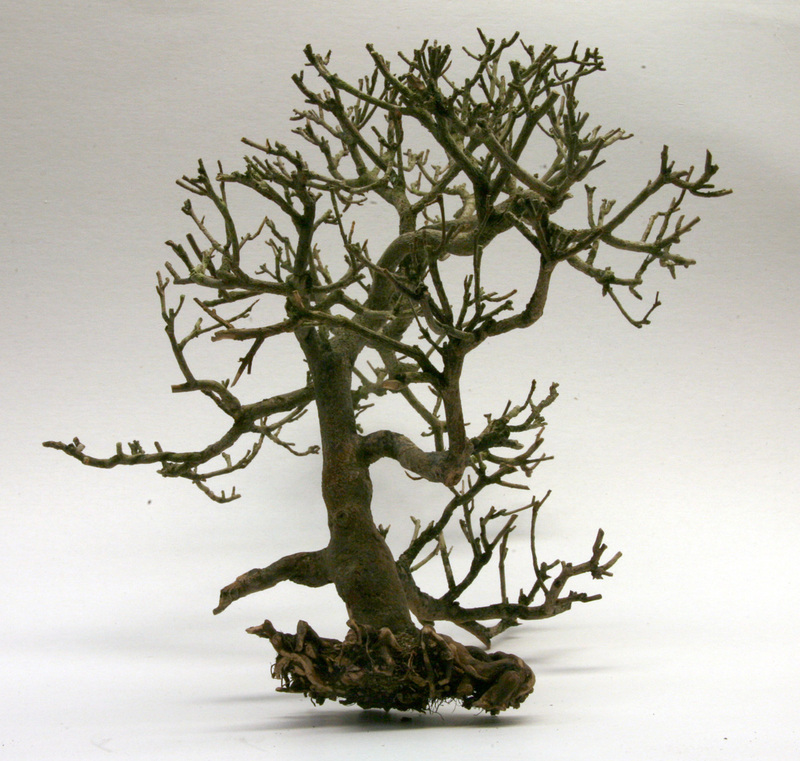 First he pruned and tapered the dead branches to improve their scale appearance. Then he built up the base of the tree using wood putty and a block of wood so that the root structure was realistic. The bonsai folks call this nebari. Next he drilled about 50 holes in the branches to accept springs of Supertree. The Supertrees is a trade name for a natural weed from the Arctic area of Lapland. Scenic Express imports and markets them as "Supertrees." 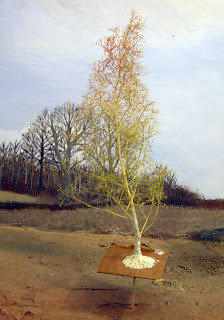 Once the Supertrees were glued in place, I painted the tree with woodland camoflague brown, medium grey and flat back. Rob says the tree resembles a sycamore in this configuration. It started out as an azalea bonsai. 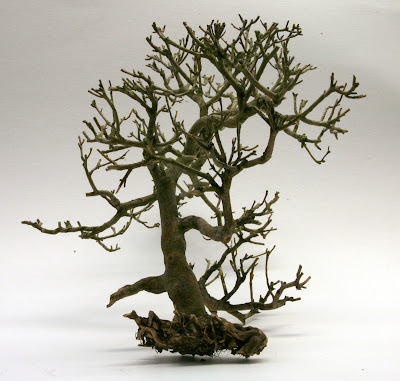 The whole tree s quite delicate as the dried out azalea and the Supertrees are very brittle. The tree is secured to the block of wood. When it comes time to install it, the whole block will have to be integrated into the scenery as the tree is too delicate to remove from the block of wood. I 'll have to cut the foam scenery to accept the block. So it's not a big deal. Since it is such a big tree, I plan to place it near Stonemans station where the scenery is deep. While he was working on the tree, I made some smaller understory trees for the Clairborne Creek Scene and finished the two latest boxcars. 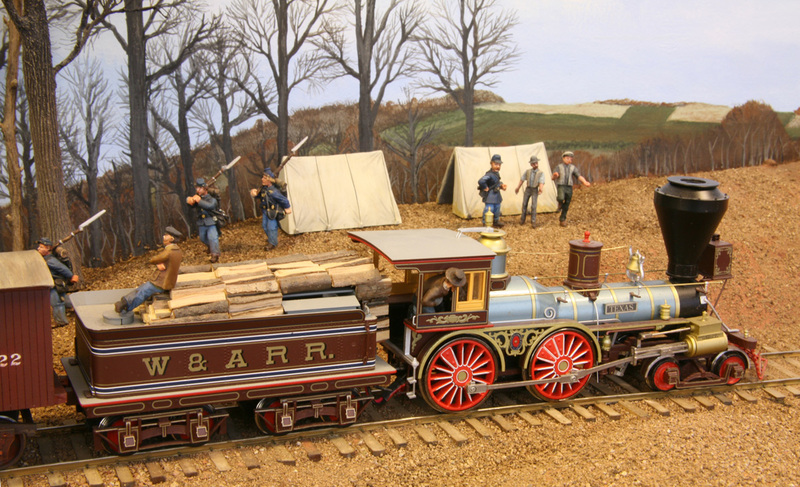 Rameesh Bishop has been building nice military and civil war railroad dioramas for quite some time. 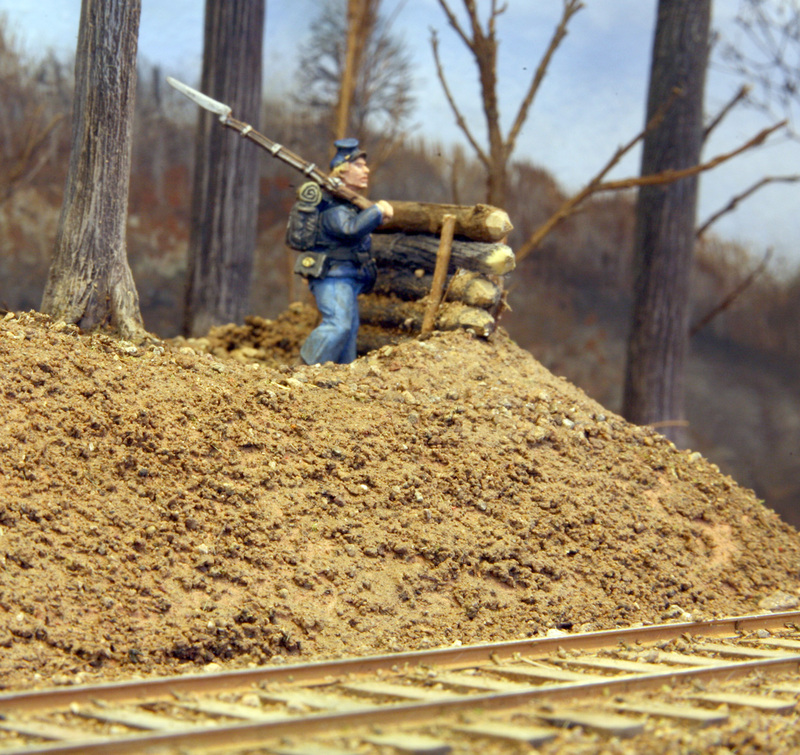 I recently came across his Flickr page with 31 images showing some of his ACW RR dioramas. The link is here and is well work a look. Some of his work is for sale. He also does a nice job in weathering his models. This beautiful shot makes me think, "I really need to add a covered bridge to my RR even though it is not prototypical." 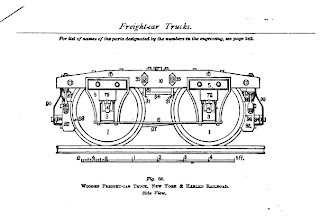 During the civil war railroad freight cars had manual hand brakes. There were no air brakes. Nor did the locomotives have air pumps to supply the needed compressed air. On a freight car, only one truck was equipped with brakes. In comparison to modern times, the brakes were much simpler and totally manually operated. 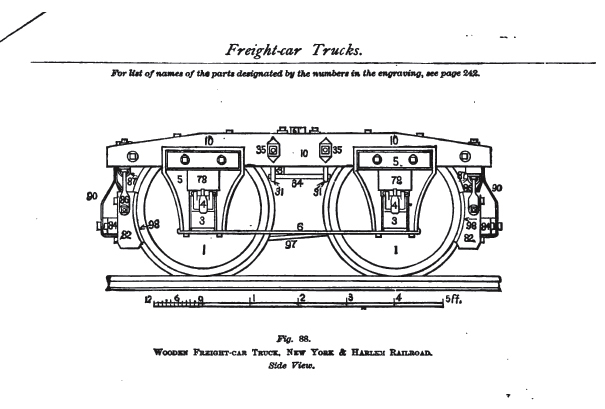 The wooden brake shoes were mounted on wooden beams that hung from the exterior ends of a truck. Gravity kept the brake beams and shoes away from the wheels. To engage the brakes, a crew man had to turn the brake wheel located either on the top or end of the car. This wheel took up a chain on a ratchet that was connected to a linkage in the truck. As the hand wheel turned the linkage caused the brake beams to retract towards the wheels. The shoes rubbed the wheels and the cars slowed down. To release the brakes, the operator turned the wheel in the opposite direction. The weight of the brake beams caused the beams to swing away from the wheels and released the brakes. because the slightest bump or jolt could toss you off. Turning the brake wheel was the job of the brakeman. To set the brakes on train, the engineer would give a whistle signal, in the case of the USMRR, one short blast. The brakemen in the cab, or already riding on the tops of the cars would scurry along the tops of the cars turning each hand wheel until the train came to a stop. This had to be done at all time of day, in all weather and conditions. The brakeman also handled car couplings and track switches. Link and pin couplers were especially hazardous as the brakeman had to stand between two cars to couple them up. Between the hazards of coupling, falling off and collisions, it is was a dangerous job in terms of life and limb. Fortunately, the job won't be so dangerous for my operators, but the working handbrakes should make it more realistic and interesting. My objective for the weekend was to finish building two more house cars , also known as box cars. I had worked on the trucks for these cars earlier in the week. Thus, I just needed to build the chassis and bodies this weekend. But, I hadn't built a car in a few months, so the first thing I did was review the drawings for the laser cut parts. I made a few adjustments to the drawings after checking several prototype photos for detailing ideas. With the revised drawings, I fired up the laser and cut the parts for the first one. I assembled it and had some additional ideas for the second car. By Sunday evening I had both cars assembled. The photos show the cars in the process of getting decals. The car in the rear has a roof walk. In looking at various prototype photos of the USMRR, I noticed slightly more than half the cars have roof walks. So far, none of my cars have roof walks, so I decided to start adding them. Both of these cars will have working brakes. The second car will have movable doors. I even made the door latch operable (the latch is part of the etched detail parts fret), but that was just for fun. I don't expect to use them during operations. This car will have open doors, with the interior showing some details. After I took these photos I realized I forgot to add the stirrups and grab iron by the ladders. I'll add them ASAP. 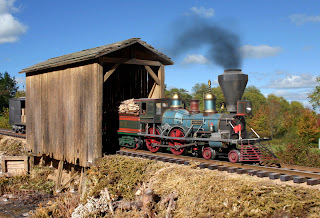 One thing is for sure, you have to like NBWs if you are going to do O scale early steam era modelling. Each truck has 20 NBWs, while the car body has about 50. 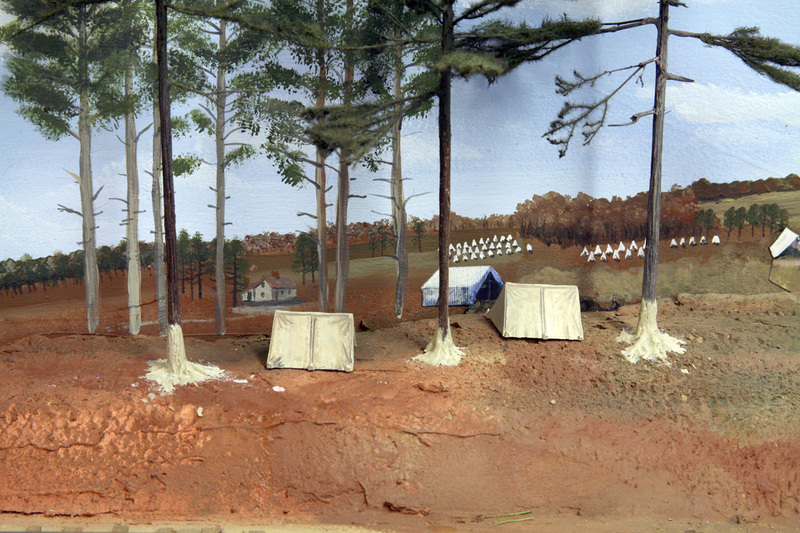 Tents and figures start to bring the scene to life. The order I placed with Renedra Miniature in the UK arrived. 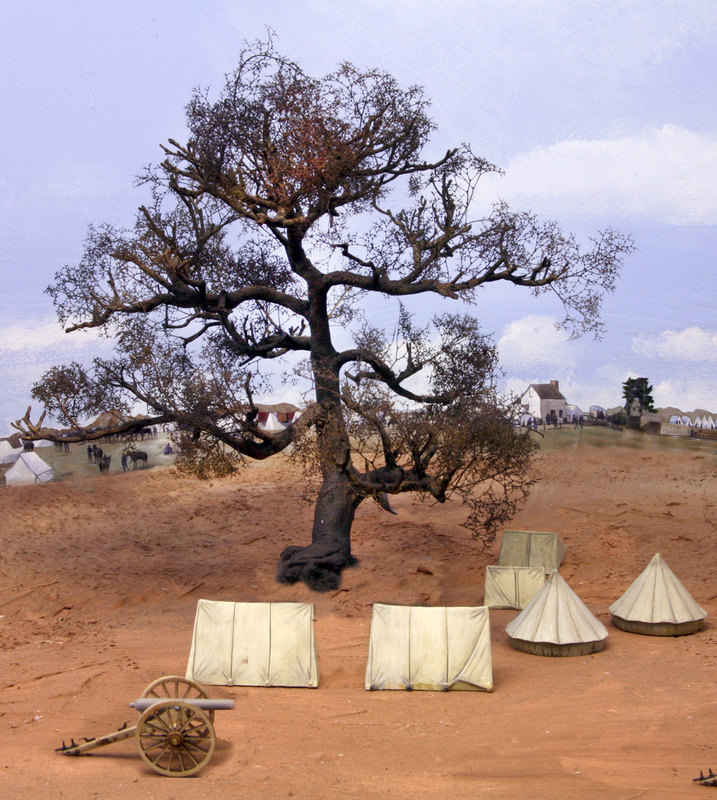 I ordered tents and figures from their camp scene in 1/56th scale. They offer three different types and sizes of tents so I ordered an assortment to evaluate. I also ordered two sets of their camping figures. I did a quick paint job on the tents to see how they looked. I primed the injection molded plastic (styrene I think. 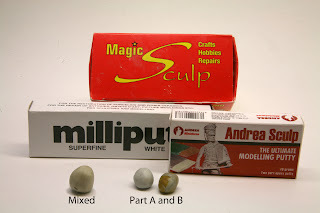 It is definitely not the flexible plastic that you find in Airfix and Hat figures sets that is very hard to paint and prone to chipping) with a coat of grey and then a coat of flat white. I painted the tents with several off-white shades of including Ceramcoat Acrylic Sandstone, Mudstone, Anthracite and White. The overall color I was shooting for was a dirty off-white. These tents have been in service for several months and should be starting to show dirt and wear. 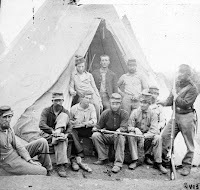 The Reneda Sibley and small pup tent work well in the background. The tents take paint nicely. Some tent ropes, laundry and other details will add a nice touch. The Renedra tents are sturdily molded. They should hold up well in gaming service. Some of the tents come with the flaps open and the opportunity to super detail them is there. The tents include a camp fire and some cots too. Being designed for 28mm wargaming, they are small for 1/48th scale. 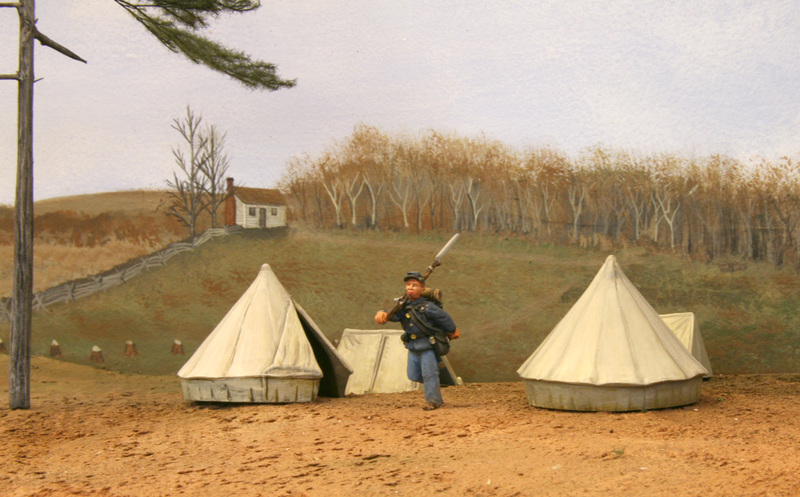 The small pup tent and the conical Sibley tent in particular are small for use in O Scale scenes. A full scale Sibley tent would be 4.5 inches in diameter in O scale. They will have to be used in the background for forced perspective. 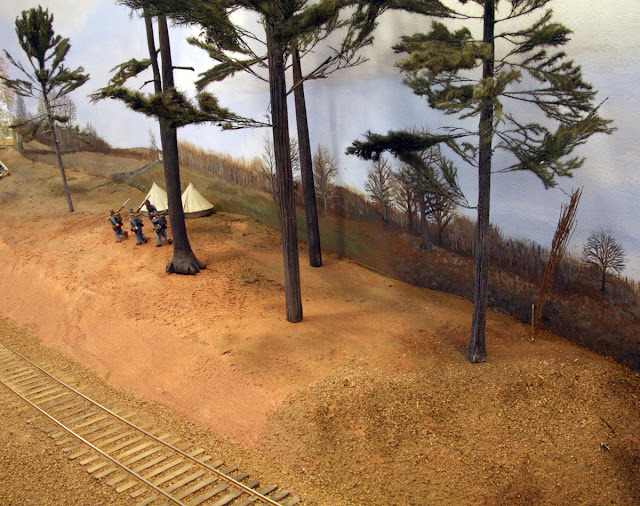 The larger rectangular tent is well proportioned for O Scale and came be used in the foreground. They sell a pack with just this tent type, which helps us O Scale ACW modelers. 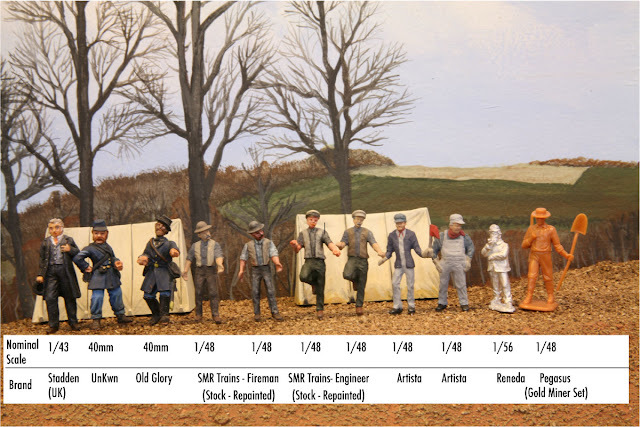 SMR Trains engine crew compared to other figures. 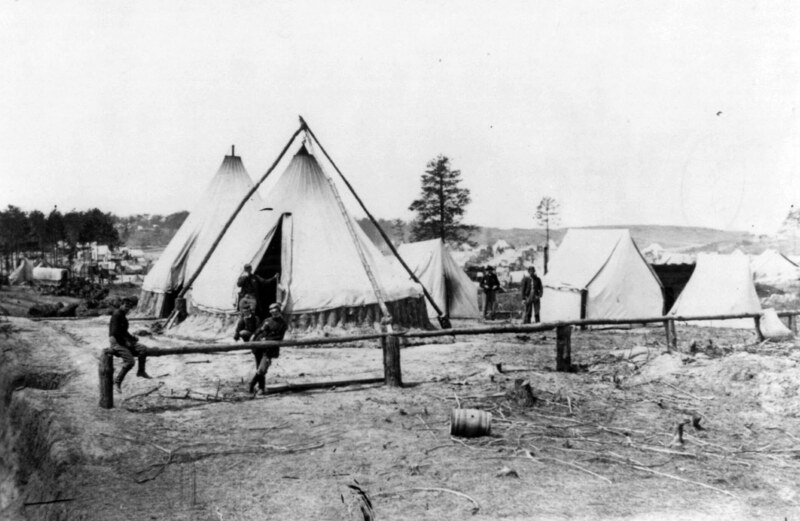 In the back are the large Renedra rectangular tents. While I had the paints out, I touched up the paint jobs on two SMR engine crew figures. 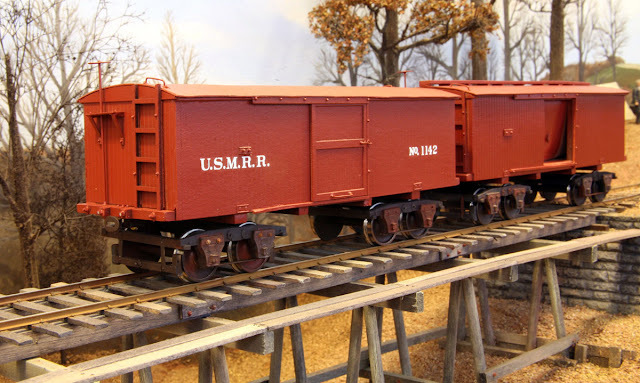 These are 1/48th scale figures designed to fit in SMR locomotives. The figures are well sculpted with only a few flaws such as a pit in the inside of the elbow of the engineer and some rough facial detail on the same figure. Both figures have well done faces and paint up well other than the facial flaw I just mentioned. The pants folds don't seem to flow with the figures very well and they are not too deep. Thus it is probably not worth spending too much time to shade them to a contest quality. The vests are well done, as are the hats. The two figures are well proportioned and have that "lean" look that many ACW personnel displayed. They come pre-painted, but I added some additional shading and detail. In the photo above you can compare the stock and repainted figures. I also picked up some Artista figures. These are well proportioned for O Scale. They just need to be back dated to the ACW era. In between fighting a nasty cold and catching up on Alkem Scale Models orders, I did a little development work on my O Scale truck design. 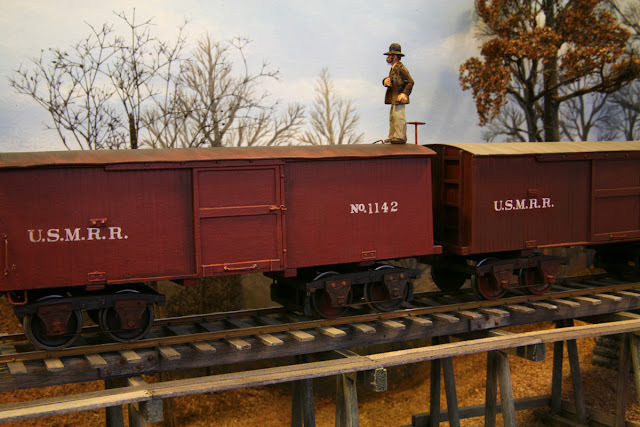 My objective is to make the overall width of the standard O gauge trucks as narrow as possible. This will allow the car bodies to hang over the trucks more prototypically. Standard O gauge wheel sets are already about 0.0729 inches too wide due to the wider track gauge. Adding another 0.14 inches between the outside face of the wheels and the inside of the side frames to fit the Intermountain axles was making the trucks too wide. I decided to reduce this distance. To do this I had to file about half of the needle point off the end of the axles on my Intermountain wheel sets. I am using IM Wheel stes because they are less expensive than the alternatives. I looked at NWSL wheels but they are more than double the cost. The photos show the results. The revised standard gauge narrower trucks sit between the original wide standard gauge trucks designed to accommodate the full width of the Intermountain axle length and a P48 truck. 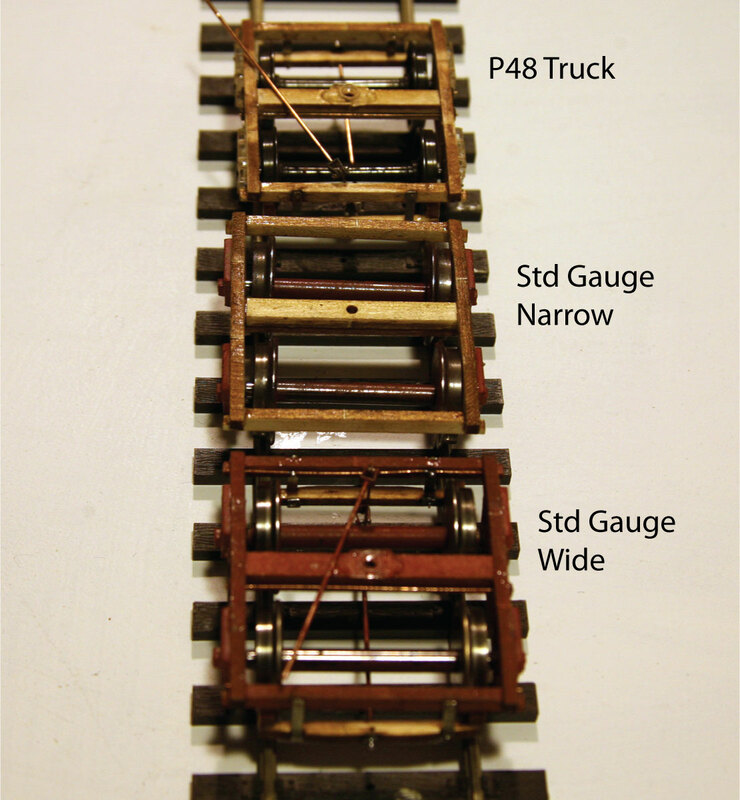 As you can see the narrow design is not quite as narrow as a P48 truck, but about 0.090 inches narrower than the earlier standard gauge truck. Note the narrow truck doesn't have brakes but the other two do. The working brakes will still work with the narrower design without modification. All three cars roll freely. Because of the axles rests on the taper the wheel sets can move laterally a bit in the trucks, but that doesn't seem to increase rolling resistance. Looks like these might be ready for production. In late August 1999, my family and I visited the Mariners' Museum in Newport News. While there I took a few photos, mostly shots of the kids. These were filed away in slide notebook. I happened to be looking through my non-digitized slide notebooks for another purpose and came across these shots of the SS Armenia, a Hudson River side wheel paddle steamer from the 1850s. The model was on display at the museum. 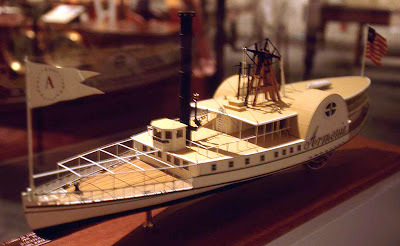 There is a set of plans available for the Armenia Paddle wheel steamer, so it is somewhat popular with model builders. It is amazing, but this was the only ship model I photographed while there. Coincidence or a foretelling of my current project? I took these shots hand held with 64ASA slide film. Some of them came out pretty well considering the conditions. 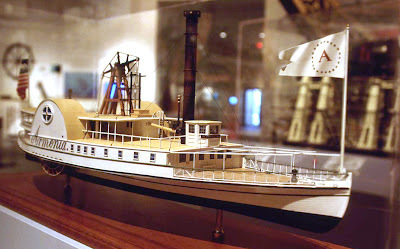 The Hudson River Day Line steamboat Armenia was built in New York City in 1847 by Thomas Collyer. Registering 528 tons she measure 185 feet in length by 28 feet in breadth by 8 feet depth hold. At her launching she was the largest and finest steamship on the Hudson River. 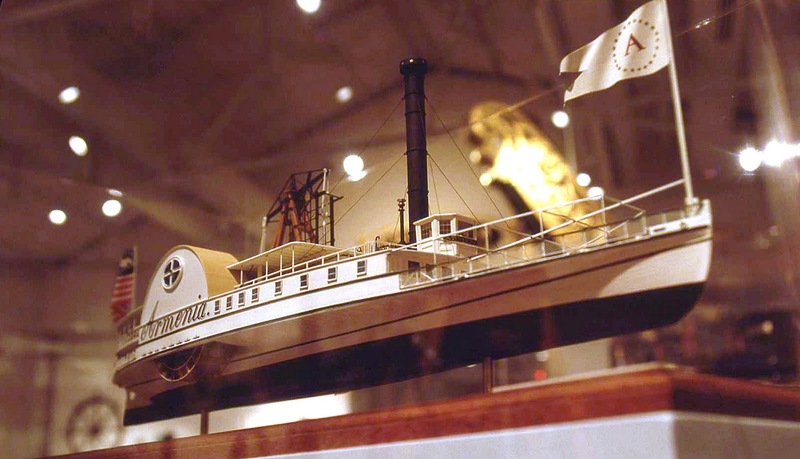 She offered luxurious on board amenities, including restaurants, barber shops, parlors and live music which included a steam calliope- a musical instrument intended to attract passengers from competing steamers. She entered the New York to Albany day service in 1848, but was regularly withdrawn for other routes, and it was some years later that she began a number of continuous seasons on the run. She was a fast steamship, but by 1859 larger rivals had entered service and the decision was made to lengthen Armenia to 200 feet. On May 1st, 1869 she opened the new and shorter New York to Rondout route and continued to be a popular vessel. 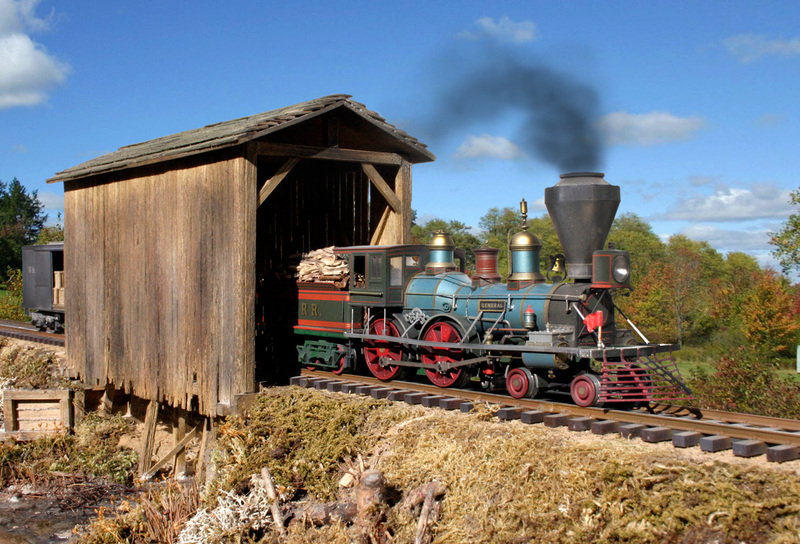 In 1875 she opened the New York to Albany season, and the following year ran between Brooklyn and Newburgh. In 1883 she was sold to the Henry brothers & Co. of Baltimore and used as an excursion vessel between Washington, D.C. and Lower Cedar Point, where the Henrys owned a hotel and resort. While laid up for the winter at Alexandria, V.A. she caught fire on January 5th, 1886 and was scuttled to put out the flames. 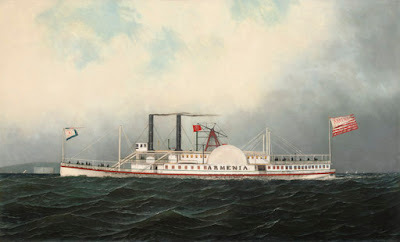 James Bard, a famous 19th century American maritime artist, also did a painting of the Armenia. 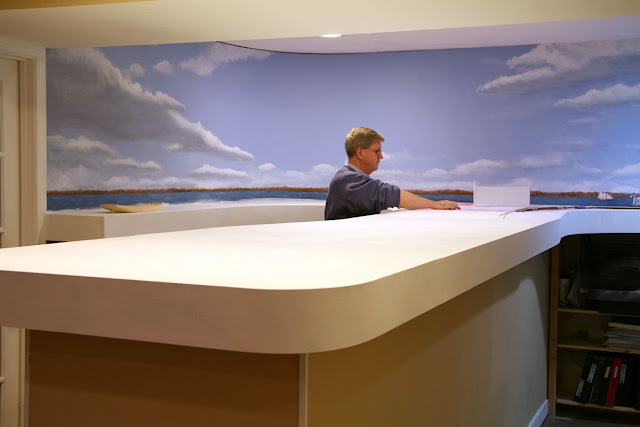 The Athenaeum web site has a 106 examples of James Bard's paintings available for viewing. It's worth a visit if you like side wheel paddle steamers and other period ships. http://www.rcgroups.com/forums/showthread.php?t=564557 He posted some more photos of the model at that link. The Mariners' Museum was really very good. Since it has been over 10 years, perhaps a new visit is in order. I have read that they have done a lot with the USS Monitor restoration since I was last there. That in itself makes it worth the trip. One bummer I encountered in dealing with the museum was that the they were totally unwilling to help me research ship plans when I contacted their research department last year. 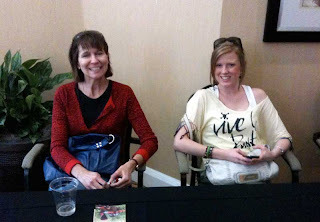 We are back from Prototype Rails 2011 at Cocoa Beach. We just made it through Atlanta before a massive storm with snow and ice was coming in - whew! The meet was quite enjoyable. It was great to see everyone. The weather was pleasant, if a bit cool. The talks I went too were quite good. I presented my talk twice and it went over very well. 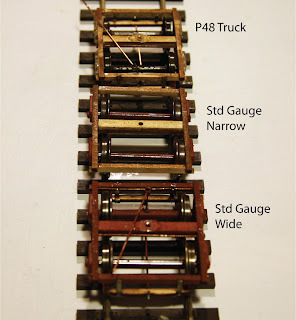 I concluded the talk with a demonstration of the working brakes on a box car using the photo etched parts I developed. To share in the fun, I made this brief video showing the demonstration. The New Year marks the end of heavy construction on the layout with the installation of an 8-foot shelf under the wet bar. I was able to put away the carpentry tools and get rid of many of the wood scraps and pieces I will no longer need. 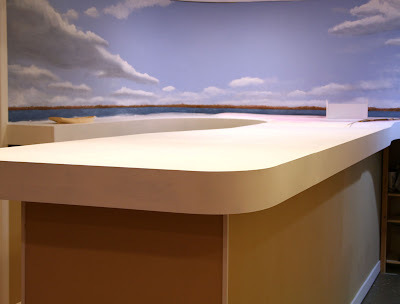 I painted the wet bar with primer and then put two coats of room color on the base. 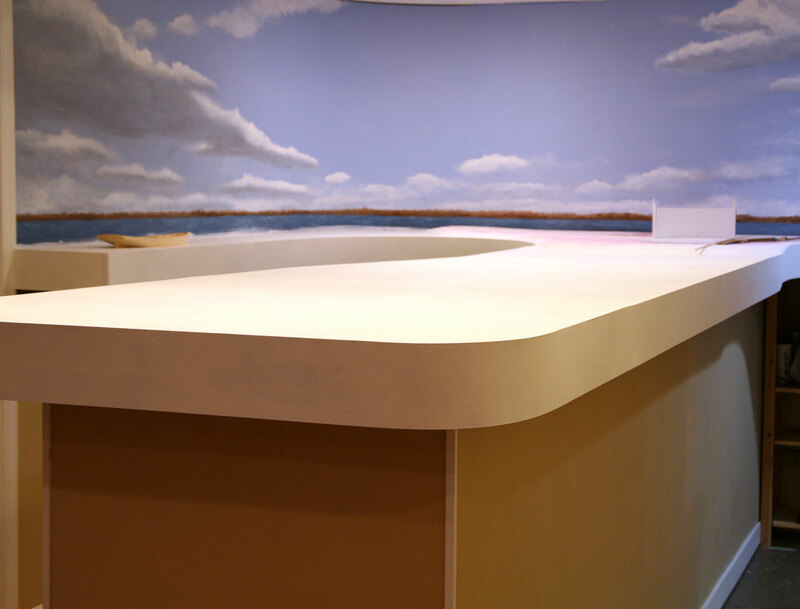 The trim pieces are white, so the support structure of the wet bar looks like the rest of the room. I installed dark blue curtains on the inside of the wet bar. This allows easy access to the storage underneath, while also making a neat appearance. AW inspected progress and gave it the CINCHOUSE seal of approval. On Sunday Gerry Fitzgerald drove up from Charlottesville to do some track laying. He is in between layouts right now as he works as a history professor at UVA and lives in apartment. His previous layout was a 20 x 20 feet freelanced model of a C&O branch in the Richmond, VA area. He was the former editor of the LDSIG Journal as well as for the Seaboard RR Historical Society. He likes laying track, so he took on the job of spiking track by the tunnel portal at Brook. The track on the curve here experienced some kinking due to seasonal humidity changes. Actually it rained today and the kink was less noticeable, but when it is cold and dry it popped out. With four spikes per tie, the kinks should be resolved. He got a good meter section of track spiked. Gerry spiking rail at Brook. While Gerry worked at Brook I did a variety of jobs including spiking from Stoneman's to Falmouth.The track should be completely spiked in this area now. I checked a problem area at the north end of Potomac Bridge. It seems like the bridge expanded a bit and threw off the gauge at the tracks at the north end. I will monitor that situation and determine if more drastic measures are needed. Next I soldered some feeders to rails that I missed the first time through. My plan is to have feeders on every section of rail. I also started using a cutoff wheel in my moto-tool to cut more expansion gaps in the rail to allow for seasonal expansion. Finally I replaced one of the florescent fixtures at the far end of Potomac Creek. The original light fixture failed, probably due to a ballast problem. I been having problems with severalof these shop light fixtures. I replaced the two-tube shop light with two smaller fixtures under cabinet style light fixtures. They should be easier to replace if they fail. 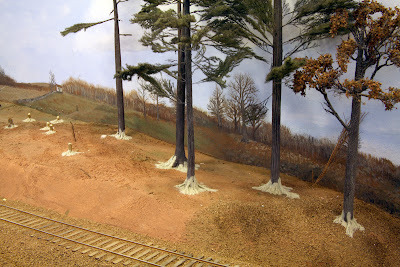 Once we finished up, we cleaned the rails and ran a four car test train from Aquia Landing to Falmouth. We dropped off a car at Brook, then continued to Falmouth. There we cut the engine off, turned it on turntable, and reconnected to the train. We took the train back to Brook where we parked the it on the siding for the night. Gerry tests out the operators pit between Burnside wharf and Aquia Landing. He liked the space.